I had a request last night for my recipe for Roast Turkey. Last year I deep fried my turkey in my butterball deep fryer but this year I have decided to go back to basics and make my Mom's wonderful recipe for Roast Turkey. Just the good old fashioned traditional way of making the juiciest turkey ever. 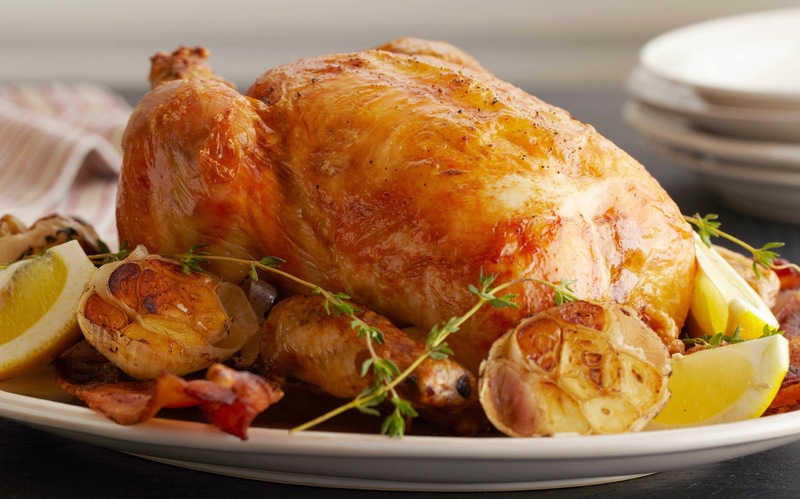 Remove the turkey from the refrigerator about an hour before you are ready to roast it so that it can come to room temperature. Preheat the oven to 425 degrees. This is just to get the oven nice and hot before roasting. You will turn the heat down later. Take the bag of giblets and the neck and rinse the turkey inside and out. Pat the turkey down all over the outside with paper towels to dry it thoroughly. Lift the turkey and generously salt and pepper the inside of the turkey cavity. Stuff the cavity with the bunch of thyme, the lemon, the onion, and the garlic. Tie the legs together with string and tuck the wing tips under the body of the turkey. Next, make an compound herb butter. In a small bowl, combine the softened butter, fresh herbs, lemon zest, salt and pepper, and garlic. Stir together with a spoon until well blended. Next, run your hand between the skin and meat of the turkey, gently separating them and being careful not to tear the skin. Do the same from the other side, loosening the skin around the thighs and legs. Use about two thirds of the compound butter to rub over the actual meat that is under the skin of the turkey. Remember, the butter will melt as it cooks so don't worry too much about smoothing it out. Save the remaining butter and set aside. Next place your turkey on a roasting rack inside a large roasting pan. Pour 2 cups chicken broth in pan under rack, making sure not to allow the turkey to make contact with the broth. The juice will steam the turkey keeping it moist and tender through roasting process. Cover tightly with foil. Transfer the pan to the oven and cook at 425 degrees for 45 minutes. 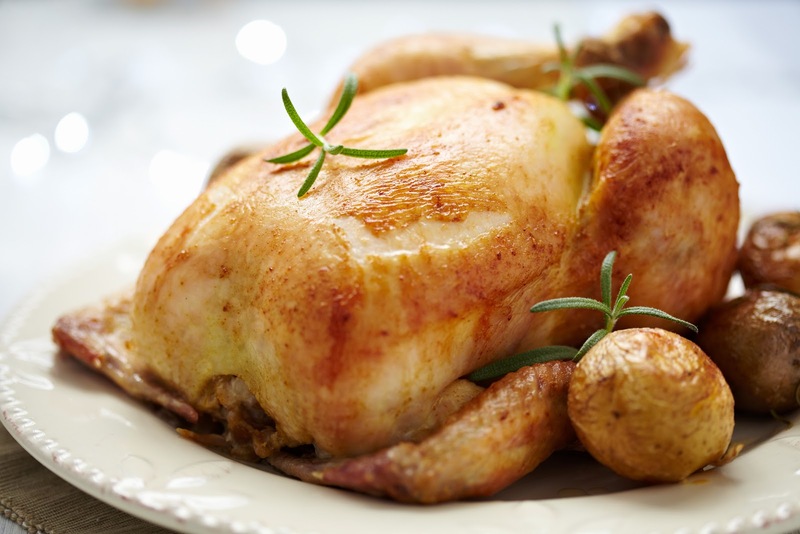 Reduce the oven temperature to 350 degrees and and continue to roast for about 2 hours. Then take turkey out of oven and remove foil. Melt the remaining compound butter in the microwave and then brush it all over the turkey. Continue to roast for another 30-40 minutes or until you get a reading of 160 degrees when you insert an instant read thermometer in the thickest part of the breast. For those last 30-40 minutes, you want to monitor the browning of the skin and once it has reached the desired shade of golden brown, after about 30-40 minutes, tent loosely with foil throughout any remaining cooking time. (A 12-14 lb. bird will take approximately 2-2½ hours). Another way to tell if your turkey is done, is to make sure the juices run clear when you cut between the leg and the thigh. Most important: you want to allow the turkey to rest before carving. If you carve the turkey immediately out of the oven it will be tough and dry. Remove turkey from oven and Let the turkey rest, loosely covered with foil for 20-30 minutes before carving.